I’ve never been a fan of highly repetitive ab exercises like crunches. Simple reason? I get bored—100 crunches just doesn’t sound like a fun pastime to me. And now that we know that crunches are not as effective as once thought, they seem even less appealing. Crunches are isolated movements that aren’t really recreated in our daily life unless you like to walk around hunched over. While they primarily focus on the superficial abdominal muscles, aka the elusive six-pack, crunches tend to avoid the deeper, powerhouse muscles underneath, which are in charge of core stability and support a healthy back. Ultimately, crunches can actually do more harm than good because of the strain on the lumbar spine after repetitive flexing without true core integration. Here’s the quick anatomy lesson. There are four groups of muscles in our abdominals. The rectus abdominis helps us fold forward. The internal and external obliques, or side waist muscles, help us breathe, turn, and flex our torso. The transversus abdominis, the deepest of them all, basically acts like a corset for all the internal organs. These muscles work together to help us in multiple daily movements, not just flexing the spine as crunches would have you believe. So it makes sense that it would take a more integrated exercise plan to engage them all effectively. Thankfully, there are a lot more effective and fun ways of strengthening your core. In fact, a teacher friend recently pointed out a not-so-commonly discussed fact about core work and yoga. “It’s all core,” she said. Indeed, yoga is actually a great place to invite your core into action. Without core stability and strength, we wouldn’t be able to find ease in transitioning from pose to pose, experience many arm balances and inversions, or we would more quickly tire out in standing poses like Warrior III (Virabhadrasana III) and Half Moon Pose (Ardha Chandrasana). Think of core work in yoga as smart body mechanics. When we maintain body awareness in all yoga poses, we are actually training ourselves to be more intuitive about how to tap into our core power: to cultivate more strength, ease, and joy in each pose. Mindfully engaging our core in our practice translates to more strength, ease, and joy in our movements off the mat, as well. So keep in mind that every yoga pose can offer its own take on core mobility and strength when we study them more deeply. However, if you haven’t got time to go through hundreds of poses, these next five, simple yoga core poses can help develop core awareness, build your strength, and not to mention give you a trimmer look, too. Give them a go and enjoy more core power in your yoga! This pose is an all-around core strengthener. It calls upon all the abdominal muscles to stabilize and keep the spine protected and lengthened. Come onto all fours and walk your legs back so that you line up shoulders over wrists, or in the forearm variation, your shoulders are over your elbows. 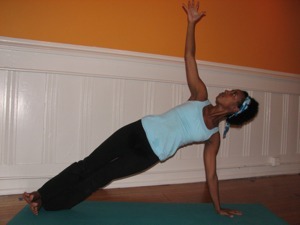 Be sure that your shoulders, hips, knees, and ankles all form one line, like an inclined plank. You can always bring your knees to the floor if you need the additional support, as long as you can maintain the same plank alignment from shoulders to knees. Firm up your legs, knit in the lower ribs to firm up your abdominals, and keep your chest broad with your breastbone moving forward. Hold for five breaths. As you build strength, you can aim to stay in the pose longer. This pose targets your side waist muscles as well as tones the abdominals in the front body. 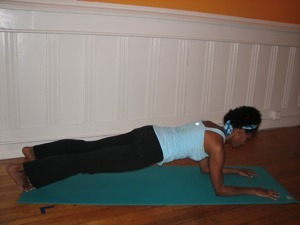 From a plank position, bring the legs together and roll to the outer edge of your right foot. Stack your legs as you roll your left shoulder on top of the right. Extend your left arm up to the sky. Your shoulders should be stacked over your right wrist to avoid strain on the wrists. Hug the legs together as though they’ve become one leg, and lengthen your tailbone towards your heels as you firm up your abdominals. This will help stabilize the pose. Spend three to five breaths here, before moving to the other side. This pose is a great way to work on core stability and awareness that will make standing poses like Warrior III and inversions much more accessible. Start on your hands and knees. Extend your right leg to the back as though you’re pushing against an imaginary wall. Keep your hips level and squared to the floor. Once you feel stable with your core firmed and spine long, reach the opposite arm to the front like you’re shaking someone’s hand. Similar to Plank alignment, your shoulders, hips and extended leg should form one straight line. Spend several breaths here before moving to the other side. As you build strength, for an added challenge you can try this same asymmetry in Plank with one leg hovering and the opposite arm reaching forward. As this pose taps into all the abdominal muscles, it brings particular awareness to the lower abdominals and hip flexors, as well as unites the core action to the back body. Sit down and lean back until you can balance between your sit bones and tailbone. Let your feet lift off the floor and bring the shins parallel to the floor. You can keep the knees bent, or if you have no issues with your low back and feel comfortable, extend the legs to straight for the full expression of the pose. 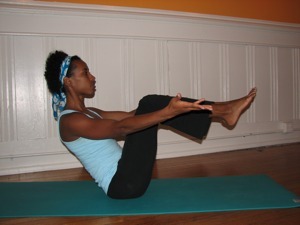 Arms can come out to the sides, or hands can grasp your thighs if you’re newer to this pose. Keep the shoulders rolling away from the ears and moving down the back. Invite your breastbone to lift up, and draw your belly button in to support a long spine. Spend several breaths here, adding more time as you build strength. This active variation challenges the side waist muscles as well the deeper core stabilizers. Lie on your back with knees over your hips at a right angle, shins parallel to the floor. Take your arms out to a T. Exhale as you take your knees over to the right; keep them in line with your hips (i.e. maintain the 90 angle from your body). Let your knees hover as you work to keep the left shoulder descending with your chest facing up. Work to press the knees against each other. Inhale to take the knees back to center. Do the other side. Alternate both sides, five to eight rounds to start, and sync the movements with the breath. Exhale to twist and hold. Inhale to center and prepare. Once you develop strength, you can work up to keeping the legs straight in a pike as you twist.